(Newser) – This is either a big fan of the cartoon Rick and Morty, a hopeful collector, or a very brave and nostalgic soul: A packet of 1998 McDonald's Szechuan sauce has sold for $14,700 on eBay, reports Time. 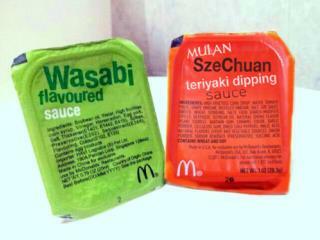 The strange background: McDonald's put out the dipping sauce in that year as a publicity tie-in for the Disney movie Mulan, and it received a giant nostalgic push when the character Rick from the popular Adult Swim show pined for it in a recent episode. That led to a viral campaign for McDonald's to bring it back, complete with multiple Change.org petitions. The company has hinted it might do so, and hopeful fans have noted that a remake of Mulan is in the works for next year. But the eBay sale is the strangest component yet. More fake Newser. "Just Sold" & "Someone paid" are unknown by Newser. Considering the seller has 2 feedback and the buyer (and high bidders) have zero feedback, the sale will probably never occur. But leave it to Newser to mine social media for the daily fake news without any context or little bit of skepticism.